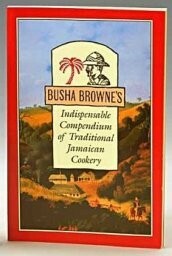 BUSHA BROWNE'S Indispensable Compendium of Traditional Jamaican Cookery A descendant of the noble Irish family Sligo, Charles Adolphus Thorburn Browne - - familiarly known as Charlie Browne -- has spent most of his 75 years "cooking up a storm". He whiled away many hours of his boyhood days in the kitchen of his family home Tryall Estate in Hanover, western Jamaica. Later, cooking became a hobby and he retrieved from his family archives recipes for authentic Jamaican sauces, jams, pickles and condiments made from the great variety of exotic Jamaican fruits and vegetables; all unique, spicy and delicious. From this treasure trove, specially selected recipes are being prepared and bottled for Busha Browne's Company in Jamaica to be enjoyed today much as they were over 200 years ago.